In 1946, genius linguist and codebreaker Meredith Gardner discovered that the KGB was running an extensive network of strategically placed spies inside the United States, whose goal was to infiltrate American intelligence and steal the nation's military and atomic secrets. Over the course of the next decade, he and young FBI supervisor Bob Lamphere worked together on Venona, a top-secret mission to uncover the Soviet agents and protect the Holy Grail of Cold War espionage - the atomic bomb. 1972. The Munich Olympics. Palestinian members of the Black September group murder 11 Israeli athletes. Nine hundred million people watch the crisis unfold on television, witnessing a tragedy that inaugurates the modern age of terror. Back in Israel, Prime Minister Golda Meir vows to track down those responsible and, in Menachem Begin's words, "run these criminals and murderers off the face of the earth". A secret Mossad unit is mobilized, a list of targets drawn up. Thus begins the Israeli response, a mission that unfolds not over months but over decades. The Mossad has never spoken about this operation. No one has known the real story. Until now. In this riveting account, Aaron Klein peels back the layers of myth and misinformation about the "shadow war" against Black September and other terrorist groups. This is less a story of the Munich Massacre, than of the Israeli hunt for those involved in that event. Having just listened to the CIA history, Legacy of Ashes, the difference between the two secret services is striking. 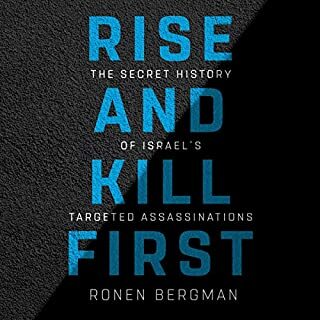 While the author notes that mistakes were made, and questions whether the assassinations made any difference, the Mossad at least had the appearance of competence, unlike the CIA. The recording is very good. While I cannot vouch that all of the foreign names were properly pronouced, Mr. Rudnicki did a credible job; is there anything that he can't read? I think I would listen to him reading a phone book! In all, I enjoyed the book. It is very specific regarding names places and dates, so its it good for those who enjoy history. The pacing is good. It is written from an Israeli standpoint, but is fairly balanced, noting the mistakes that were made and some of the motivations involved. I found it a fascinating listen. This tale is like a real-life James Bond story without the silly stuff. Justice is applied violently (and sometimes erroneously) as the reader rollercoasts through two decades of Israeli-Arab conflicts. I could barely turn off the recording, doing so only when I had to. I let a friend listen to it (he is not big on audiobooks) and he was enthralled. Can you tell I liked it? One of the best I have heard. You do need some working knowledge of current affairs of the latter 20th century though. The quality of the narration is also superb. The Munich Olympics was a heartbreaker! 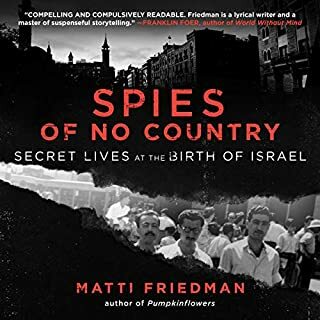 This book tells the whole story, from first concerns about security weaknesses in Olympic Village housing through the attacks, and then follow-up by the Mossad. I rented a documentary about this (I think it was called "One Day in September") after listening to this account. It was a great addition to the book, with lots of actual footage of people and events described so well here. The narration is excellent, as well. Highly recommended!!! One of the Best! Absolutely Fantastic! They don't get much better than this book! WOW! What a book! I was a little too young to remember the Munich Massacre, so after this book, I also rented a documentary of the event. There is so much good stuff in here, it's hard to know where to start. 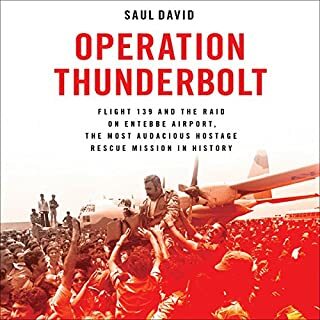 The details of the hostage taking and the unbelievable response of the German Special forces were not only fascinating, but very troubling as well. The author maintains his neutrality well. He portrayal of the German Special Forces is balanced with the story of the operatives who killed the wrong person (and went to jail for it). Hard to believe that some of this stuff really happened. The one story that sticks with me is the one that really got the Israelis in trouble in France, when they took out a terrorist (while being very careful not to kill his wife and child) in a rather unorthodox way - something I didn't realize was possible at that time. Another highlight is the "Chocolate" story - how the Israelis got to one of the terrorists living in Iraq. VERY GOOD BOOK! I've probably listed to over 100 audiobooks, and this is one of my favorites! Highly recommend! Very well written and superbly narrated. 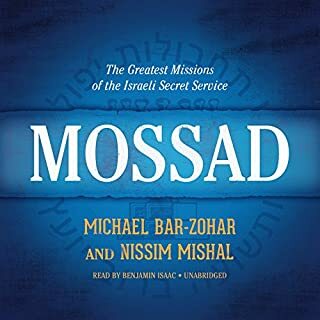 A great story of the Mossad and their determination at meeting out justice. 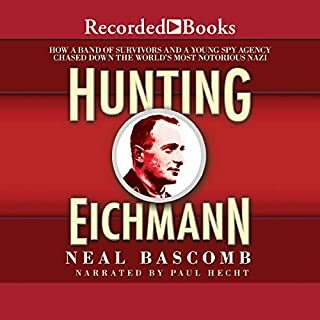 If you liked the movie "Munich", you'll love this audio book. Striking Back goes into far more detail than the movie could. You won't be sorry! Would you listen to Striking Back again? Why? I think so because I often miss things the first time around. All of Mossad. I have a deep admiration for those men and women and the work they do. I could never do it but it is work that must be done and they did it. So everyone that had to strike back basically. There are many who question Mossad and this operation but Israel is in a unique position. A tiny country surrounded by countries that want to destroy it, retribution must come into play (it also does in other middle eastern countries) as a kind of deterrent. We can question the morality of it all day long but that is not what this book is about. It does make you question it and examine it but it is about a group of men and women with a job to do and the trials of tribulations of doing that job. Jews dying on German soil only 18 years after the end of WW2 was something Israel could not have simply ignored, no matter what anyone might think otherwise. To say that I was more than a little shocked at the mistakes and incompetence of the Israeli government and security would be an understatement. I chose this book after seeing the movie "Munich". 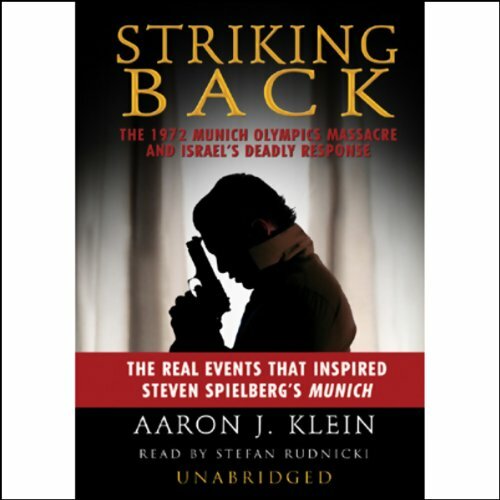 The movie delt with the aftermath and payback of the Munich massacre and this book delt with the actual massacre and how the Israeli athletes were put in a risky situation with not much thought to their saftey. To much trust and too much "passing the buck" quashed any chance these men would have had at survival. A real eye opener! Basically, after the Munich Olympic Terrorist event, the Israeli government adopted a policy of assonating anyone that they could find who was involved. The widespread myth is that it might have taken them a decade, but they got every last man, they always get their man, you can't hide from the all knowing Mossad. The reality is that even the vaunted Mossad was shockingly ineffective and on occasion downright inept. So if the Mossad is approximately the best in the world at this, but still not very good at it, it says something profound about the task. It would seem that you can use terror against the terrorists, but expecting a lot more than that from covert operations is rarely realistic. Certainly expecting them to "fix" the terrorist problem is dangerously naive. I found the book a little bit emotionally draining. I seemed to invest in one killing, and then another, and then another. But in many ways this seems strange, the book is neither brutal nor graphic, if anything it's roughly the opposite, slightly clinical. I liked this book and I learned a lot about the Munich massacre from this book (I was alive but very young when the actual event occurred). I found the first part of the book to be more captivating than the last two-thirds. The latter part of the book was not bad by any means, just not as engrossing as the first part of the book which dealt with the actual hostage-taking of the Olympic athletes and their subsequent deaths. I will reiterate and validate what other reviewers have said: the book is slightly dry and the narration, while good, can be a bit monotone. I also had some difficulty keeping track of all of the many secondary characters due to their similar-sounding names. Granted, I am from the U.S. so Palestinian names can be confusing to me.That being said, this is a very informative book and one I thoroughly enjoyed. I would recommend it to anybody who enjoys history and doesn't need said history to be made more palatable by being packaged in novel form. Perhaps the most surprising thing about the Munich massacre is the severe incompetence of the German authorities during the hostage crisis and leading up to the massacre, and even in the years after the massacre. They refused to admit any wrongdoing whatsoever. The incompetence is described using numerous examples. Stefan Rudnicki's gravelly, overly serious narration is certainly adequate enough, although sometimes it sounds as though he's got cotton balls in his mouth. If you particularly enjoy police procedurals, this book has enough detail to keep you interested for a while. Solid and passionate narration gives life to a thrilling historical tale regarding terrorist attacks, covert assassinations and foreign espionage. Provides an in depth view of the operations of the Israeli Defense Forces and their Palestinian counterparts. For a book called Striking Back I am surpised to say when the book focused on the Mossad assassinations it lossed its narrative cohesion. By contrast the first third of book about the Munich Massacre is superb and you can really tell that Klein is passionate about the subject. All in all good but not great, might have been four star if Rudnicki's narration hadn't started to sound like he was bored of the book around half way through. This is completely one-sided. It is a glorification of the Israeli secret services of the nineteen-seventies (referred to as "warriors" and "combatants"). The Palestinian opposition is portrayed as vainglorious and hateful. Third parties like France and Germany are depicted as cowardly. The notion that extra-judicial killings carried out in other sovereign nations might be wrong does not seem to cross the author's mind. 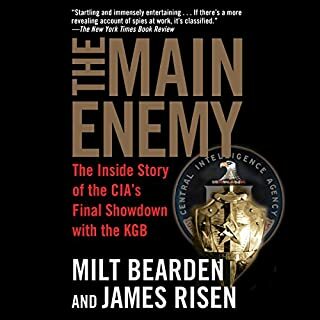 So, if you like the idea of a biased historical account of how teams of hitmen went around killing opponents, with all the planning, build-up, and execution of operations involved, you'll like this.